In an unexpected move Republican Presidential nominee Donald Trump traveled to Mexico to meet with Mexico’s president. After their private meeting, they held a press conference in which they said they talked about ways to improve the way of life in both countries. Some people believe Trump’s trip to Mexico is a desperate move to win the Latino vote but his supporters believe it’s a way to show he’s sincere in wanting a strong relationship with Mexico. Donald Trump landed in Mexico Wednesday morning to meet with its president Enrique Pena Nieto. During a press conference they spoke about the mutual respect they have for one another and the importance of establishing a strong relationship. “The bond between our 2 countries is deep and sincere and both our nations benefit from an open and honest relationship between our two governments,” Donald Trump said. Although Trump has made controversial comments about Mexico on the campaign trail, Pena Nieto set that aside and said Trump’s presence shows he recognizes the importance of U.S and Mexico relations. California Associate Representative Guillermo Moreno believes Trump’s visit to Mexico is a step in the right direction. “Donald Trump is a negotiator he’s going there for a purpose, he wants to sit down and negotiate and that’s a good way to look at it,” Moreno said. 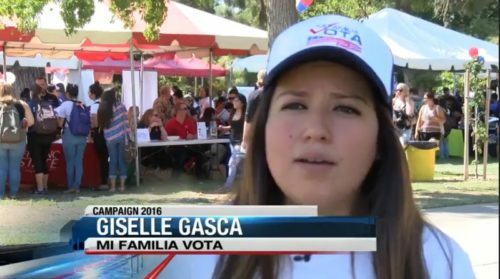 “Mi Familia Vota” Giselle Gasca was shocked to learn about Trump’s visit to Mexico and believes it’s a desperate move from that may confuse Latino voters. “If he really wants to connect with the Latino voters he has to go out to our barrios, our communities to our towns. Speak to Latino and Hispanic media and our leaders,” Gasca said. Trump said both countries will benefit if they cooperate on the following five shared goals to end illegal immigration, secure the the 200 mile long border, dismantle drug cartels, improve the North American Free Trade Agreement and continue to promote economic expansion. People wondered if Trump would be talking about the wall he wants to build between the U.S and Mexico and he did but they did not discuss who should pay for it if it ends up happening.